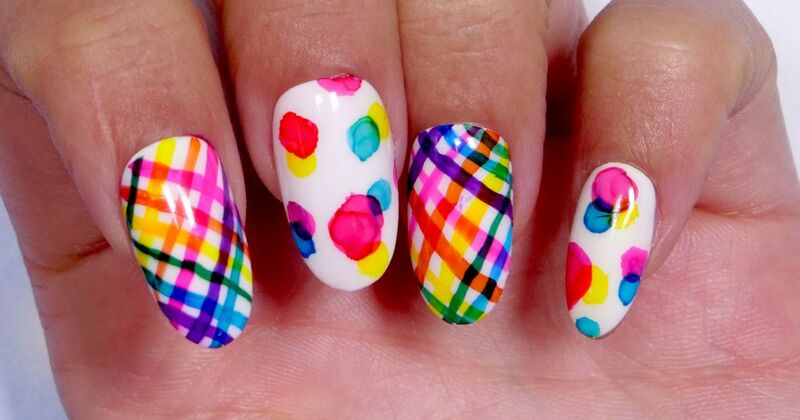 Love it or hate it, but nail art is here for the long run. If you want to adorn your fingers with fun art ink designs but are on the fence about taking the plunge, this list will help you sail through your voyage. One of the biggest blockers related to nail art design is the incertitude of what doodles to draw on your fingertips. Think of this list as a mini handbook of inspiration. Save it for when you’re feeling spirited and want your nails to match your mood. Show it to your besties as well because it’s always better to share inspiration than to keep it hidden. If you like the look of the marble on your kitchen counter, consider reproducing it on your nail beds. With this tutorial, you’ll go beyond the classic black and white marble appearance to replicate a vivid multicolored effect. Start with a pink base coat and layer the hue with purple, orange, black and gold alcohol ink. Get the tutorial here to see what else you’ll need to really make this colorful marbling ink design shine. Gingham has become an integral pattern for the spring season. 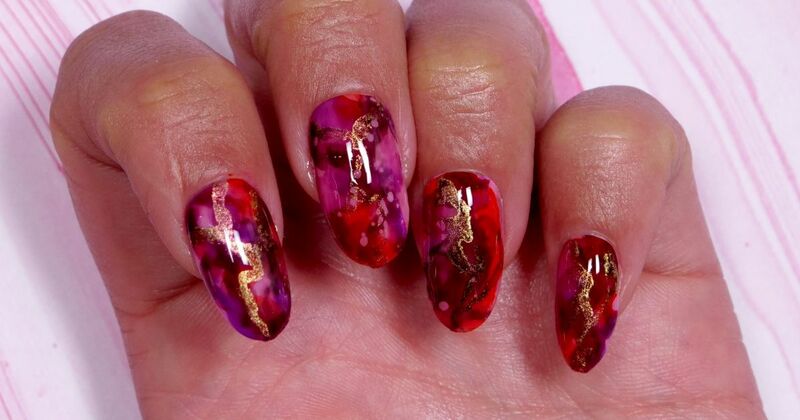 It’s no surprise the trend has ventured beyond the sartorial sphere to land squarely in the nail design arena. Prep nails with a white base coat and let the color dry completely before moving on to the next step. You can use a UV or LED lamp to speed up the drying process. Use a striping brush to draw intersecting lines in magenta, orange, yellow, green, blue and purple alcohol ink shades. Finish with a top coat to seal in the design. View the full tutorial here. 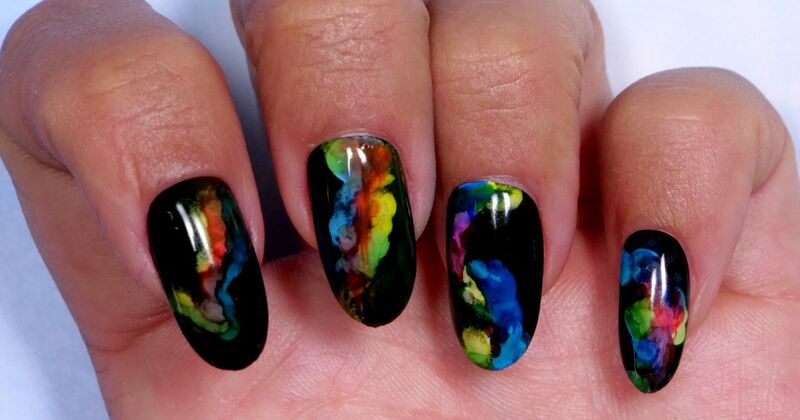 This nail design will inspire you to bring forth your inner Van Gogh or at least the spirit of his apprentice. If you struggle to replicate the elaborate designs seen at nail salons, then save a snapshot of this tutorial on your mood board. You can easily create an abstract masterpiece by using wispy brush strokes. Apply a pale peach gel polish as the backdrop. To really nail this look, you’ll need to dip a fine tip brush into a dish with isopropyl alcohol. 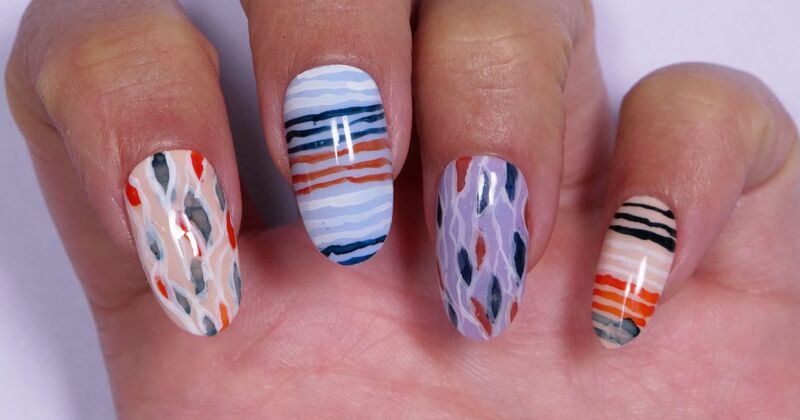 Wet the same brush with blue and black alcohol ink and dab it onto your nails to create short wavy lines. Repeat the same steps with an orange ink shade. Click here to watch the rest of the tutorial. The arrival of spring means nature is in full bloom. 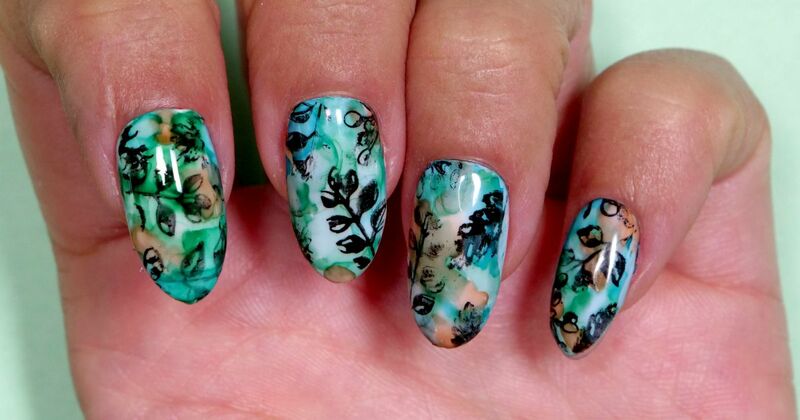 If you’re not a floral dress type of girl, then an alternative way to rock botanical motifs is on your fingertips. You’ll need the assistance of a leaf stamp to re-create this spring-inspired design. Simply dab a bit of black gel polish onto the stamper and press the design on top of your nails. Get the tutorial here. Roses are beautiful but they can also look quite plain. Sometimes, it doesn’t hurt to revamp a standard symbol of beauty. This tutorial shows how to elevate the look of a rose by creating a vitreous, ombre finish. The design is incredibly simple to replicate. Apply a black gel polish as the base coat, and draw white swirls that resemble rose petals on top. 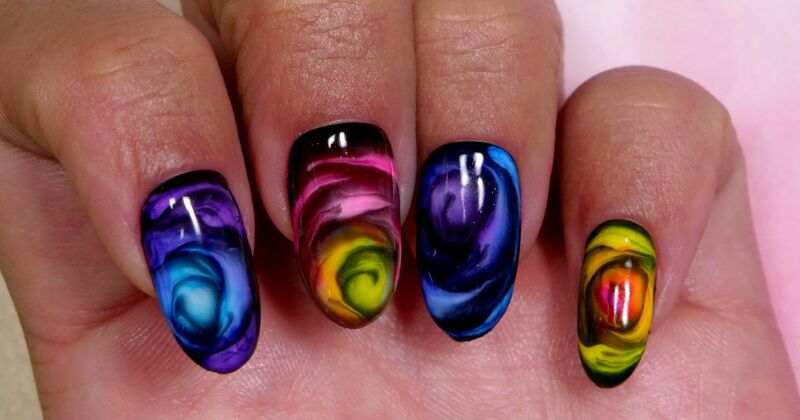 Swipe blue and purple alcohol ink onto the white swirls, and seal the design with a clear top coat. View the tutorial here. Now that the temperatures are warming up, you’ve probably shed your bulkier layers of clothing. It’s also time to get your hands out of the winter protection program. There’s no better way to do this than to replace your standard neutral manicure with an attention-grabbing rainbow smoke nail design. Find the tutorial here. Music festival season is in full swing. If you don’t file this tutorial away for the next event, then you’re seriously doing yourself a disservice. 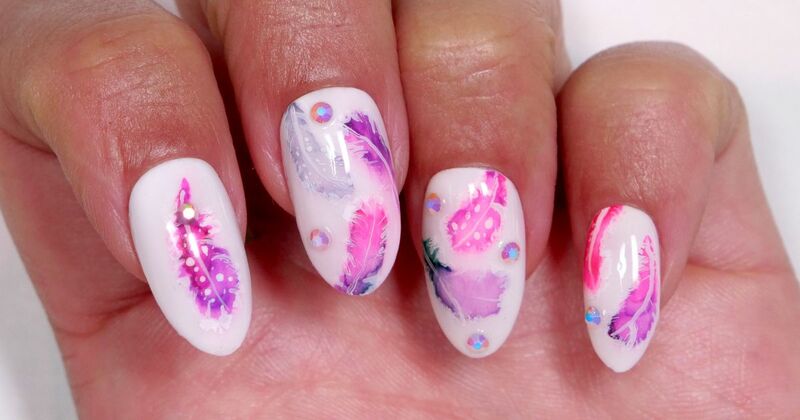 Learn how to create this carefree feathered nail art by watching the tutorial here. You’ll need a white base coat, three alcohol ink shades, a feather pen nib and rhinestones to do justice to this look.